that I intend to send to client whose attempt to buy a condo was not successful. of those who stick with rent. I always make exception for those whose are likely to move on short notice – like those good folks serving in the armed forces. Well that ‘simple email’ has now evolved to a series of eight pages – to include one cash outlay chart that details year-by-year what goes out of the pocket of homebuyers and renters …and who keeps that money: You or the landlord. If you just landed on this page, please take a look below I have links to the other pages on this series – they all complement each other. When we got to the closing table, the young couple who was selling their house had owned the property for approximately 6 years – about half of the time my client rented the apartment – walked from there with a nice little check for over $66,000 – not so bad, hum? The client that I mentioned above who is now a ‘proud homeowner’ and he is quickly making up for the lost time. First of all he bought a spacious home (much larger than the apartment he used to rent) with a large lot in a cul-de-sac located in a historic and desirable neighborhood. The home did not need rehab and the repairs were ‘cosmetic’ – which means he could have lived there for years on end without the need of doing any major projects. However he decided to update the kitchen, HVAC system and add a half bath in the main floor. All which are also ‘proactive’ ways of adding value to the home …and consequently adding equity. I estimate that in the short period he has owned his home, my client has added at least $50,000 to the value of the home – considering the expenses of material and labor (some of which he did it himself) it is a great return on the investment. (*) Principal, interest …and [the ‘darn’] MIP will never go up! MI/MIP (Mortgage Insurance Premium) can be removed when he has paid 80% or more of the LTV (loan to value) of the house, which will also further add to his savings. Okay, I understand that it is not all folks that have the money and/or expertise to do those improvements. So here comes a reminder: This client moved from an apartment that he rented for 11 years! He left from there with no equity whatsoever! 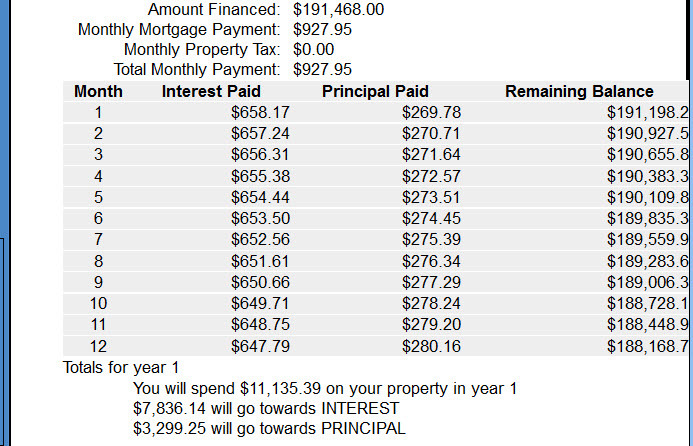 The mortgage payments of his mortgage (principal & interest), property tax, hazard insurance AND the ‘darn’ MIP will be $1,279.60 per month for the next year. In this equation the only two things that can go up are property tax and insurance. A homebuyer accumulates a ‘little’ equity every month …but in 30 years it will mean a big number! Besides when you come to retirement age you will have paid your home and you will live there without having to worry to come up with the money every month. Homeownership: The Gift that Keeps On Giving! I am not done yet with trying to get you on board of how homeownership is a tool for creating wealth organically. (*) Home was bought in March, so buyer started payment in May because mortgage is paid ‘in arrears’ = previous month …contrary to rent that is paid in advance, so he will end up paying 8 months for the first calendar year. Please check the other links below to learn more about this series and you will see that a home is an asset that brings returns in more the one ways – like income tax deduction of ALL interest paid and property tax paid, Home value appreciation, principal accumulation – it is a wealth of information and it makes for a great time investment on your future financial wellbeing. Knowledge Base - This series dedicated to explore the Buy Vs Rent quest is comprised by 8 intertwined articles. I recommend that you further your knowledge by reading all of them - enjoy …AND learn! Still Need Help Finding What You Are Looking For?